Occurrence: Castor bean is toxic and should not be eaten. The reported allergic reaction followed accidental ingestion. Other Information: Castor beans are not used for human consumption. The castor plant and its parts are a source of potent inhalant allergens. Symptoms:Urticaria, drowsiness, dyspneic and Quincke's edema (swelling of lips, glottis) after chewing a single bean. Blood pressure was 6 mmHg (Navarro-Rouimi & Charpin 1999 ). Note that ingested ricin may prove fatal in a dose of 0.03 gm. Cross reactivity between green coffee and castor bean aeroallergens among coffee workers has been reported. 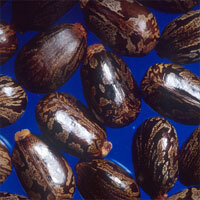 Castor beans are not used for human consumption. The castor plant and its parts are a source of potent inhalant allergens. Navarro-Rouimi & Charpin (1999)  conclude that sensitization was by inhalation before chewing the castor bean. Cross reactivity between green coffee and castor bean aeroallergens among coffee workers has been reported. There are also reports of contact allergy. Anaphylactic reaction to castor bean seeds. Castorbean allergens in tissues of catfish reared on a diet containing castorbean pomace. Not reported but may be stabilised by disulphide crosslinks. Allergen properties & biological function:The major allergen of castor bean is a 2S albumin seed storage protein , with a molecular weight of 11kD on SDS-PAGE under native conditions and 6 and 8kD under reducing conditions. The accession number P01089 is given for the unprocessed precursor protein. Allergen purification:Castor bean extract prepared by grinding castor beans into a fine powder and extracting in PBS for 3 hours at room temperature. The extract was centrifuged at 2000g for 15min and the fatty layer discarded. Extract was analysed by SDS-PAGE and IEF. The extract was also used to purify the 2S storage albumins as follows: the protein was extracted into saturated ammonium sulphate solution at 4C overnight and the precipitated protein was centrifuged at 2000g for 15min. The precipitate was resuspended in 0.05M imidazole HCl buffer and fractionated on a Sephadex G-50 column. The second peak was pooled and re-chromatographed to give a very pure 2S albumin preparation. Ric c 1 (P01089) and Ric c 3 (1707274A) are iso-allergens (Bashir et al 1998 ). Thorpe SC, Kemeny DM, Panzani RC, McGurl B, Lord M.
Allergy to castor bean. II. Identification of the major allergens in castor bean seeds. Thorpe SC, Kemeny DM, Panzani R, Lessof MH. Allergy to castor bean. I. Its relationship to sensitization to common inhalant allergens (atopy). Bashir ME, Hubatsch I, Leinenbach HP, Zeppezauer M, Panzani RC, Hussein IH. Ric c 1 and Ric c 3, the allergenic 2S albumin storage proteins of Ricinus communis: complete primary structures and phylogenetic relationships. Pantoja-Uceda D, Bruix M, Gimenez-Gallego G, Rico M, Santoro J.
Allergen properties & biological function:The allergen functions as a storage protein in castor bean. A legumin-like protein from castor bean has been sequenced (AAF73007, Q9M4Q8) but it is not clear if this corresponds to Ric c 2. It is 58% identical to Ana o 2 from cashew nuts.